Sinkholes can be a frightening issue, especially if you do not know how to deal with them. Some sinkholes, however, are not as serious as others. Often, a sinkhole can be repaired quite easily and with little hassle. This being said, sinkholes are still a danger to your foundation. If you notice any sings that a sinkhole has formed or may be forming near your home, contact a professional foundation repair contractor immediately. The professional team at Atlas Piers can help you with all of your sink hole remediation Alabama projects. A sinkhole occurs when the surface layer of the earth collapses. They come in all different sizes – some are tiny indentations, while others are dangerously large caverns. Most often, sinkholes are formed when the bedrock below the surface soils, which usually consists of limestone or sandstone, erodes. Because of this, water is the most common trigger for sinkholes. Some signs that a sinkhole may be forming under or around your foundation include: cracks on the exterior or interior wall of the home, walls and floors separating from one another (uneven or sloped floors), and the appearance of holes or depressions in the yard. If a sinkhole forms under your foundation, it could cause the foundation to shift or crack, which in turn leads to a variety of other issues – wall cracks and floor cracks, sloped floors, sticking windows or doors, leaning or bowing walls, and more. When it comes to sink hole remediation Alabama, a main goal is to prevent any further movement by stabilizing the area. This can be done by a sub-surface repair that involves underpinning. Underpinning is a process by which steel push piers are driven into the stable soil beneath voids formed by sinkholes. The weight of the structure is then supported by the piers and they can be used to raise the foundation back to its original position. Once this process is complete, it may also be beneficial to add helical piers, which work much the same way as push piers, but are screwed into the ground to provide extra stability. This will ensure that the foundation is completely stable and well supported. Another important part of sink hole remediation Alabama is void filling. 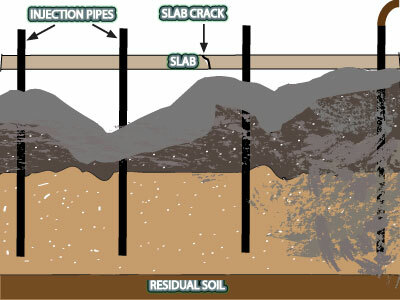 This is a procedure that is done to fill voids beneath the foundation and stabilize the soil. Pressure grouting is the void filling method used by Atlas Piers. This method involves drilling holes through the slab and injecting a grout through the holes to build up the soil. Once this has been done, the slab is stabilized and can once again support the weight that it was designed to support. Atlas Piers are the experts on these sink hole remediation Alabama services. Our team has an abundance of foundation repair knowledge that will serve to keep your home safe and healthy. We also provide you with the top quality products from ECP (Earth Contact Products) the leading supplier in foundation repair equipment. If you notice the sings of a sinkhole near your home, don’t hesitate – contact us today!